Hi there and a happy Thursday to you! Today I’m sharing another card that I made for my nephew who turned 2 years old last week! 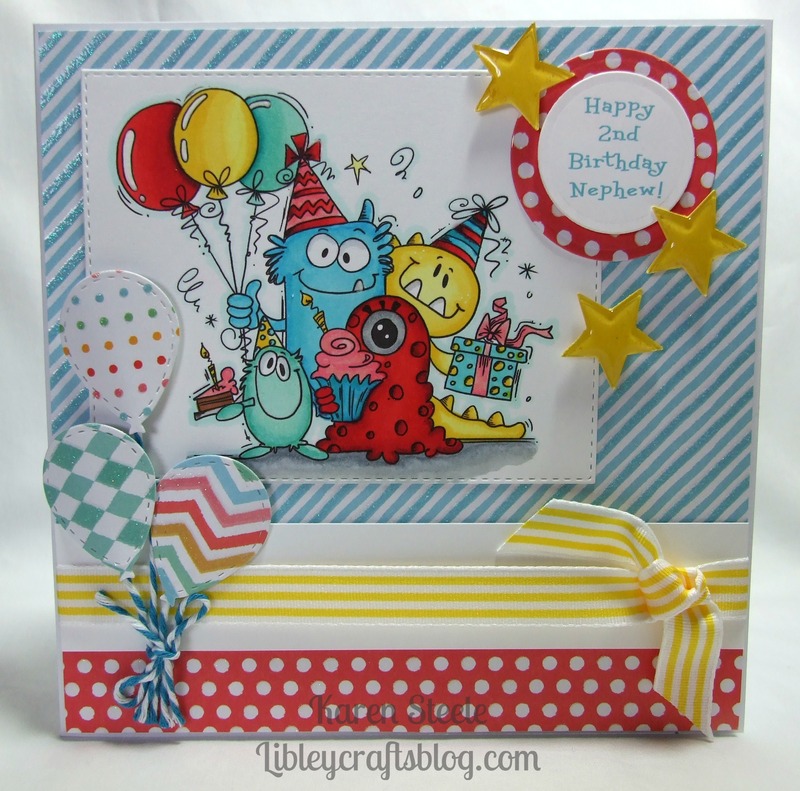 This one was to be from my sister and brother-in-law and I used this fab digi from Bugaboo Stamps called Birthday Monsters. I thought these fun, bright papers by Deco Time were a great match for this image! I also used: Spellbinders Circle Dies, Memory Box Stitched Rectangle Dies, a magazine freebie balloon die, twine, ribbon, Star Epiphany Tool, Spectrum Noirs and a white gel pen. WOW~ so fun and bright and great dimension! Love the star and balloon embellishments! Those little monsters are super cute and fun! Love the balloons, stars, and ribbon, too! Karen, this is soooo cute! Wonderful embellishments to keep a little person busy looking! Cute little monsters, Karen and i totally like the FUN and BRIGHT colors. Just great. PS: How did you do that ? I´ve just upload a post to my blog and not a minute and you leave a comment. I´m speechless. THANKS !! What a brilliant fun card. I have just found your site so am off for a look around! Oh my gosh, this is so stinkin’ adorable!!! I love the papers and colors and those cute monsters!!! Spots and stripes, plenty of colors, ballons in different sizes! What a great party design!